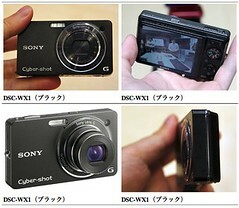 Last update (Oct 15, 2009): Sony WX1 Review at Imaging Resource. This post is a compilation of Sony Cyber-shot DSC-WX1/B 10MP “Exmor R” CMOS Digital Camera professional and user reviews, owner opinions and experiences, tests, conclusions, ratings and feedback. A downloadable sample movie / video clip is provided in the review — right-click to save the MP4 file (5.4MB footage lasting 5 seconds) to your hard drive. The review notes that the optical zoom can be operated at any time during the recording. There was good detail in the images, but the reds and blues were clearly oversaturated. But the Sony WX1’s 5x G lens with optical image stabilization wasn’t really a liability. In fact, its 24mm wide-angle focal length was a boon in such a small camera. For its extreme low light capability in such a remarkably small package, the Sony WX1 still earns a Dave’s Pick, but those without small hands should probably handle the camera first to make sure they’ll be able to operate this diminutive digital camera. The Japanese-language Sony WX1 review at DC.Watch (Google’s English version) provides a good overview of the camera’s image quality, as they present all the full-resolution images as thumbnails on one page. 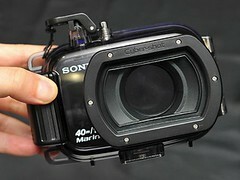 There are examples of a horizontal and vertical panorama swing photos, macros / close-ups / flowers, night scenes and landscapes, and also real-world, low-light shots demonstrating the remarkable (for this class of digital compact cameras, in my opinion) high-ISO noise performance of the WX1. Their report on the WX1 launch day (Google English translation) has photos of the WX1 in the hand, plus an interesting image of the Sony MPK-WEB Marine Case.